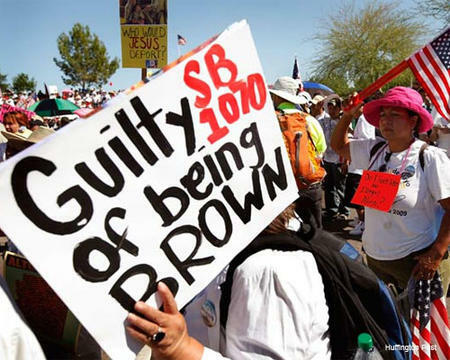 The struggle against Arizona's infamous anti-immigrant legislation, SB 1070, continues. 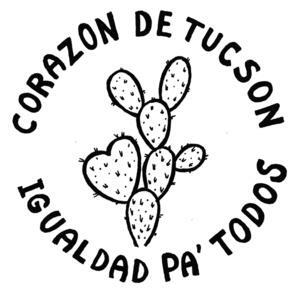 A key component of the fight-back involves a grassroots campaign in Tucson against the state's private prison industry via a broad community coalition called Fuerza! This current legal limbo leaves Arizonans awaiting word on whether police departments across the state will soon be required to investigate individuals’ legal status whenever they have "reasonable suspicion" to believe a person who has been stopped, detained or arrested is undocumented. SB 1070 is part of a suite of legislative proposals introduced over the past several years in Arizona specifically targeting immigrant and Latin@ communities with criminalizing measures and expanded enforcement operations. Among these is HB 2281, a law signed just weeks after SB 1070, which banned ethnic studies programs in the state and paved the way for the dismantling of Mexican-American Studies in Tucson schools. The unabashedly racialized rhetoric used by the proponents of such legislation has laid bare political leaders’ willingness to capitalize on white fears of immigrants and people of color to advance a legislative agenda that scapegoats and targets those communities. In border communities, the Border Patrol works closely with local law enforcement and represents a constant threat to immigrant residents. In Tucson, where the agency is a regular presence in Latin@ neighborhoods, for instance, discretionary authority allows police officers to routinely prolong ordinary detentions while the Border Patrol is summoned to assume custody. While agribusiness benefits from a relatively “open” immigration regime, the private prison industry, in contrast, stands to profit from greater restriction. Thus, the prison industry has been both a chief beneficiary and leading proponent of the push in recent years toward expanded enforcement and increased incarceration. In this regard, SB 1070 and laws like it in Utah, Indiana, South Carolina, Georgia, and Alabama represent a new and carefully refined method of more efficiently instrumentalizing immigrants in pursuit of profit by further criminalizing immigrant communities and widening the dragnet that funnels immigrants into detention centers and penal institutions. Fuerza! press conference. Credit: Chris Summit. In states such as Utah, Georgia, and Arizona, which have all passed comprehensive anti-immigrant laws, industry fingerprints have been found all over the legislation in the form of powerful lobbyists, campaign contributions, and close relationships with key officials. 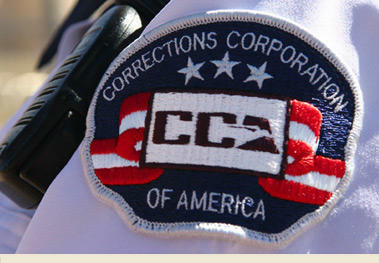 Unconcerned with the human consequences of the policies from which it profits, the prison industry has made millions as widening criminalization, mandatory detention, and mass deportation separate hundreds of thousands of families each year, destabilize c Credit: www.cca.comommunities across the nation, and undermine quality of life for residents documented and not. 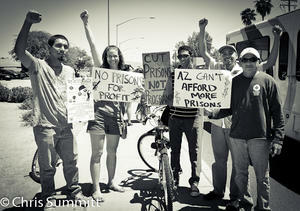 After witnessing the effects of prison industry profiteering in our own communities, Tucson’s Fuerza! coalition has responded with a campaign to build public opposition. Coalition members have been conducting cafecitos, house meetings and other forms of popular education to promote public understanding of the prison industry and build local capacity for resistance to industry-backed anti-immigrant practices. 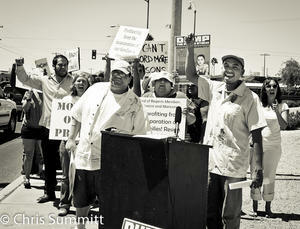 In order to spur greater national momentum against the prison industry, Fuerza! 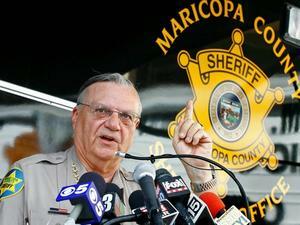 is urging lifelong Tucsonan and former U.S. Senator Dennis DeConcini to resign from the Board of Directors of the nation’s largest prison firm, the Corrections Corporation of America (CCA). Credit: Chris Summit.